If you have a growing family fleet, consider this 3-car garage plan with carport. Not only does it offer three bays and 816 square feet of interior parking, but it also delivers a handy carport on the side. The carport is just right for protecting another car or smaller motorized items from the elements. Some might even use the carport for other things such as storing firewood out of the rain and snow or as a covered patio for grilling or just kicking back and relaxing with the neighbors on a pleasant evening. Still others might use the carport as a place to work on the cars or home maintenance projects while staying nice and cool in the shade. Just use your imagination, this garage plan with carport is designed to accommodate a multitude of needs. 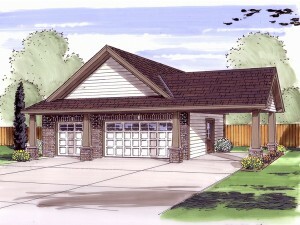 Please visit The Garage Plan Shop and view our full collection of garage plans with carports.